The edited and illustrated proceedings of a November 2016 IFAR Evening commemorating the 50th anniversary of the disastrous Florence Flood of November 4, 1966. Two conservators and the Director Emeritus of the Metropolitan Museum of Art discussed their experiences after the disaster, including commentary on mistakes made in conservation as well as the benefits of cooperation that continue to this day. The speakers were Susanne P. Sack, former Chief Conservator of the Brooklyn Museum, who was among the first group of conservators flown into Italy after the flood; Philippe de Montebello who, as a young Met curator in 1966, experienced the flood and immediate damage firsthand; and Marco Grassi, an Old Masters paintings conservator who arrived in Florence just after the flood took place. The Mysterious James Brennerman; Did He Exist and Where Did All His Fakes Come From? The authors discuss the findings of their investigation into the veracity of the “Brennerman Collection,” a cache of purported “Pollock” artworks, four of which, submitted to IFAR’s Art Authentication Research Service by different owners, have been identified as forgeries. All were said to have belonged to the reclusive eccentric James Brennerman. An analysis of the controversial new Cultural Property Protection law in Germany, including its restrictions, the Register of Cultural Property of National Significance, and the government’s goals to modernize and tighten the country’s export and import laws. The author also addresses potential problems with the law, including increased red tape and the impact on the German art market. In a follow-up story about “Operation Hidden Idol,” an investigation by Homeland Security into the illicit antiquities trade in Asian art covered previously in IFAR Journal, the authors report on the recent arrest of New York Asian art dealer Nancy Wiener. Wiener allegedly purchased items from the same suppliers as accused former New York art dealer Subhash Kapoor, which she later sold or offered for sale. The criminal complaint against Wiener includes assertions that there were many stolen objects among the works from her mother’s collection that she consigned for sale at Christies’s. Another part of the article discusses the arrest by Indian authorities of father-son art dealers Vallabh and Aditya Prakash on charges of smuggling antiquities to Kapoor. A follow-up to a story covered previously in IFAR Journal in which the contemporary artist Cady Noland disavowed a work attributed to her because conservation work had been done on it without her approval. The work was subsequently sold to an American collector who, learning of Noland’s disavowal, sued the previous owner, the dealer and the art advisor involved in the sale in federal court in New York. A discussion of the signing of the first bilateral cultural property agreement between the U.S. and a Middle Eastern country, a Memorandum of Understanding (MOU) concerning the protection of Egyptian cultural heritage. The article also discusses extensions of existing MOUs with Greece and Bolivia and the appointment of seven new members of the Cultural Property Advisory Committee (CPAC). 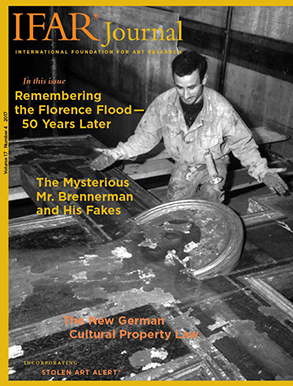 A discussion of the Holocaust Expropriated Art Recovery Act (“HEAR Act”), passed in December 2016, as invoked in some recent court cases: one concerning a lawsuit against the German government for the return of the Guelph Treasure; another concerning a suit against the Metropolitan Museum of Art for the return of a Picasso painting allegedly sold under duress. The HEAR Act has also been mentioned but not invoked in a lawsuit over two Egon Schiele paintings allegedly stolen by Nazis from collector Fritz Grunbaum. Stolen items include Jan Breughel The Younger’s Riverbank Scene, stolen from a Paris auction house in 2016; two works on paper by Christo and Jeanne-Claude, The Blue Umbrellas and The Yellow Umbrellas, stolen in Sweden in August 2016; eight works on paper by Keith Haring, stolen from a gallery in Montreal in August 2016. Recovered items include Girolamo da Santacroce’s marble sculpture St. John the Baptist; three works, including Oskar Kokoschka’s Gypsy Girl, stolen in Vienna, Austria in August 2014; three paintings, including Henri Fantin-Latour’s Bouquet of Flowers and Ambrogio Bergognone’s Madonna and Child, stolen in October 2000. Missing items include Andres Muhe’s photograph, Springer 1, missing in Berlin; two 5th century Greek antefixes missing in transit between Switzerland and Austria; Bernard Cecil Gotch’s Beaumont Street, missing from Worcester College, Oxford.